Welcome to “Doorposts of Your House,” a new blog dedicated to Biblical parenting, character training, and Bible study! Each day for the next ten days, we will be giving away a different book, chart, or other product from Doorposts. You are welcome to enter as many giveaways as you like. Our goal is to help get the word out about this blog, and give away lots of helpful parenting materials at the same time. After ten days of giveaways, we will draw one grand prize winner from all the entries. The grand prize is a complete set of ALL Doorposts’ products (read about it here)! 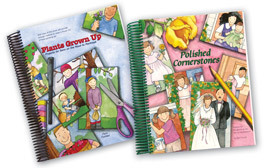 To start off our first day of blogging, today’s giveaway is a copy of Plants Grown Up or Polished Cornerstones (winner’s choice). This book is a complete, Bible-based character training resource you can use with your sons (or daughters) from age four or five on up to adulthood. Hundreds of Bible studies and other practical projects are all organized under fifty different Biblical character qualities we want to encourage in our children. Click the button to “Follow This Site” or sign up to receive blog emails in the box on the right. If you have a blog, write a post about our giveaway or add our button to your blog. Share about this blog launch on Facebook (you can use the share button below, or copy the link and share it from your Facebook profile). Important: Please leave a separate comment on this post for each thing you do. The winner will be chosen randomly from the comments. Great blog!!! I did 1, 2, 3 and 4! I shared about this blog launch on Facebook ! I signed up to receive blog emails! Love your stuff by the way! I signed up for the blog. I love your products and look forward to reading the blog. I signed up to follow this site. Excited to follow you guys! I’ll be getting the blog updates by email – thank you!! I signed up to receive blog updates via email. I “Like” Doorposts on facebook. I shared about the blog launch on my facebook page. Thanks! I just signed up to receive blog updates by e-mail! I shared this blog on Facebook. I signed up for e-mail blog updates — it makes life easier for me! I am off to write a post on my blog as well…so glad to see you guys doing this blog and am happy to promote you any way I can. I have always “liked” Doorposts. Today, I liked them on Facebook, and let all my friends know about your awesome products! Shared you on facebook! Can’t wait to see you at the homeschool fair in VA!! I am really looking forward to this blog. We so enjoy your materials! I just signed up to get your blog posts by email. Thank you! I am a blog follower now. Looking forward to it. Thanks! I shared about your new blog on FB. Have a blessed day! I like Doorposts on facebook. I shared the link to Doorposts on facebook. I shared a link on facebook with a friend. I subscribed to the blog feed. I signed up for the blog feed!!!! Thank you so much for your great products. I’ve added your blog to my RSS Feeds. I shared the blog launch on facebook!!! I “liked” you on facebook!!! I like you on Facebook. And in real life, too, but that’s beside the point! I signed up for the blog e-mails. I signed up for the email. Thank you for this offer. You’re products honor God. I signed up to receive your blog emails. I also shared your link on FB. I “liked” you on FB too. I like Doorposts on FB! I am following your fabulous blog! I signed up for the blog emails! Thank you!! I like (love) Doorposts on Facebook. I’ve shared your blog with my FB friends too! I shared this with my other “mom” friends – thank you so much for your site and your wonderful influence. I added your button to my blog! Thanks for the opportunity and, mose especially, thank you for this blog! I shared your blog on Face Book. I love everything I have ever ordered from Doorposts and I am very excited about your new blog! I signed up for blog e-mails and am looking forward to the counsel and encouragement they will provide. Thanks for sharing! I “liked” Doorpost on Facebook and I signed up for the newsletter, last night as soon as I heard about the blog. Looking forward to it! I liked Doorpost on Facebook. I am following your blog. Thanks for the giveaway. We signed up to receive blog e-mail messages. Thank you! I signed up for daily blog e-mails! I signed up for the blog emails, LOVE Doorposts! I LIKED Doorposts on Facebook! Just about to start Ruby Dolls with my girls! I “Like” Doorposts on Facebook! We signed up to receive the blog emails. Thanks for helping families be Christ focused. oops, I don’t follow directions well. I signed up for the blog newsletter. I signed up for e-mail updates. I am following you via the blog followers. I signed up via feedburner to get your emails. I put a blog button on my site. Yay, a blog!!!!! I just shared it on FB. I tell everyone about you guys 🙂 I absolutely LOVE your products ! I shared you on Facebook. I shared the blog info on Facebook. I did #’s 1 and 4!! Thanks for the opportunity to win your wonderful products!!! I love Doorposts! Thanks for the giveaway! I shared about your blog on my Facebook page! “Weekly encouragement and ideas for applying scripture in your home, from Doorposts and the Forster Family” is the tag line for Doorposts of Your House, a new blog from the online store, Doorposts. To publicize it, the Forster family is starting ten days of giveaways today. Are the materials they offer something you, your children, and your grandchildren could use? Will you win one of the giveaways? Check it out. See below. A facebook like :). Our family has always been so blessed by your wonderful resources. I ‘like’ doorposts on facebook! I linked doorposts on my facebook page for the blog launch. I entered the notification for updates to the blog. I shared you on Facebook. thank you for your Biblical Tools for Childraising! I signed up for your blog. Thanks so much. I liked your page on FB!!! Signed up for the blog. I signed up for the blog! Love your products and looking forward to this new way of enjoying them! I shared your blog on FB today! I hope others take advantage of your invaluable resources you have! Thank you! I signed up to follow you by email burner. I signed up for blog updates by e-mail. It said I was already signed up, but I hope I am still eligible for the giveaway. I do not have a blog or Facebook account. I liked you on FB! Thanks! I shared your blog on FB! I signed up to receive e-mails from your blog! I am subscribed to your blog updates. Thank you! We forwarded your message about the blog to 116 families in our e-mail address book. Helping you get the word out about how to apply the Word in our homes is a pleasure. Hi! I liked you on Facebook. Thanks for the chance to win this book. I really like your products. I also shared on FB… thanks for the giveaway! i am following the blog now!! I shared the link on fb and I’ve enjoyed your resources for years! Thanks! I signed up to receive blog via email. Thanks! I shared about this blog on Facebook. I “Liked” this on Facebook. What a great idea! I did 1, 2, 3, and 4! I’m excited to be a part of this outreach! Love your products. “For Instruction In Righteousness” is a must for every Christian home. As a Pastor I insist that our families have & use it regularly in their homes. I just posted this on face book. The blog is a great idea. I’m now following it so I can get all the updates. I shared this blog on Facebook! I shared the site on facebook. I signed up to follow this blog with emails. I just “like” Doorpost on Facebook! I’m following your new blog, which I’m super excited about, by the way! Thanks for the incredible opportunity to win your products! I like Doorpost on Facebook. I just shared your site on Facebook! I shared on Facebook for families to check out Doorposts for great parenting tools. I liked Doorpost on facebook. Would love to win so I can add these books to our church library! Thank you for this chance to win. It sounds wonderful. I now follow you on facebook and look forward to reading updates there. I’m following you. Thanks for the chance. I’m a FB fan. Thanks for the chance. I signed up for e-mail updates from your blog. I am interested in learning more about your ministry. I signed up for the blog! I shared on FB. Thanks for the chance. I liked you all on facebook. I signed up to receive blog emails. I subscribed! I love your products! I shared about this blog launch on Facebook. I “Like” this Blog on Facebook. I’ve already signed up to receive your newsletters. Thank you for your ministry! I “shared” Doorposts on Facebook. So appreciate your products. I posted a link to your site on fb. I have written about this giveaway on my blog. I love your products. I like your site on Facebook. I subscribed to the blog, liked you on Facebook, and shared your new site on my blog. Thanks!! I shared this giveaway on my Treasures from a Shoebox Facebook page here: http://www.facebook.com/pages/Treasures-from-a-Shoebox/113280698715197 (and tagged you in the post). I signed up for the email newsletter – thank you for helping our family grow to be more like our precious Savior!!! I provided a link on facebook so that many of my friends can find out about your great resources! I signed up to follow this site! Thank you for such wonderful products they have really helped my household run alot smoother. I shared your url on Facebook. I am now following your blog (and really like the background!). I look forward to reading future posts! I signed up for your weekly blog! I signed up for the email newsletter. I shared about the new site & giveaway on facebook. I’m following your blog on google reader! Excited to glean Godly parenting wisdom each week! I grabbed your cute little button and put it on my blog here: http://treasuresfromashoebox.blogspot.com/ (I already have your other button on my blog to your website; I’m going to leave that one as well). I shared the blog launch on Facebook! I shared about your giveaway on my blog & added your button! Following you on my Google Reader! I signed up for the blog. Thanks! I had a friend turn me to your website about 6 years ago and I just love your charts and tools for helping children. It has worked wonders for my son and for us as parents. I signed up for updates via e:mail. I have been wanting to “refresh” my children’s memories about the correct characteristcs a child of God should have…and this is perfect…thank you! I’d like to be entered into the giveaway. I liked you on facebook. I signed up to receive blog updates! I LIKE this on FB! I signed up to receive emails – appreciate your ministry! I *like* this on FB! I follow you in the google reader! I follow your blog…..would love to win something! I signed up to receive your blog. Thank you for publishing such excellant materials. I signed up to receive the blog emails! I love Doorposts and am excited about the new blog! I shared this giveaway post on Facebook. I signed up to receive e-mail updates. thanks for Doorposts!! God bless!! I signed up to receive your blog emails. Your products have been a blessing to us for almost 20 yrs. Thanks! I LIKE Doorposts on Facebook. Thanks for offering this give away. I already “like” Doorposts on Facebook. Thank you for this giveaway. I shared the new blog launch on my FaceBook page! I “liked” your blog on Facebook. I “liked” the new blog on FB! I “shared” you blog launch on Facebook. I liked Doorposts on Facebook and signed up for e mail updates. I followed you, liked on Facebook, shared on Facebook, and added your button to my blog. So glad a friend shared this site with me! Shared about the blog launch on Facebook! I am now following your blog on Google. I have posted info on this giveaway on my Facebook profile. I signed up to receive the blog emails. I completed # 3. I “Shared” about this blog launch on Facebook. Thanks, Forster family, for all you do! I signed up for your blog emails. I did all four suggestions! I liked you on Facebook, I subscribe to your newsletter, I put your button on my blog and I shared you on facebook. I am excited to use some of these things with my home schoolers! I just signed up for blog emails. I “shared” this blog post on Facebook! Posted the giveaway/blog special on facebook! Third time is the charm, right? For some reason this last comment has not showed up for me. I have added your button onto my blog. I am following you on my blog. I’m a facebook fan of Doorpost. I am following through the feed, I “LIKE” on Facebook, and I SHARED on Facebook. I just did #1: I clicked the button to “Follow This Site” or sign up to receive blog emails in the box on the right. I grabbed your button and put it on my blog! Loving this giveaway!!! Following the Blog. Just realized it was for each…. I posted about you on my facebook wall! Excited for all the useful tools in parenting my little one in the ways of the LORD! Deut.6: 5-9! I’ve signed up to receive blog emails. LOVE Doorposts and definitely looking forward to this!! cubscribed to the blog via email! I ‘like’ Doorpostes on FB! I’m excited to receive your blog update! Thank you for your ministry and your awesome products. I love Doorposts! I liked on FB! I put your button on my blog :)…. I signed up for your email updates. Thank you! I also posted on Twitter! I sent the email out to our entire homeschool group! I have been a “like” love of Doorposts for many years. Thrilled to see your online presence growing! I signed up to receive the blog. Thanks for the contest, and your devotion to Biblical principles in parenting. I posted a link onto my blog. Thanks for all that y’all do. I just signed up for blog updates. Looking forward to seeing you in my Google reader. I am off to share the news of the Doorpost on my profile at FB. I subscribed for updates! Can’t wait to see what comes down the line! I signed up for the email blog. Thank you! I shared the link to your new blog on FB. Signed up for the blog. Looking forward to it! Just adore Doorposts ~ and am following your blog! Also “liked” your Facebook page! I “like” you on Facebook. Thanks for all you do! And finally, I added your button to my blog! I liked Doorpost on facebook! I Like DP on Fb! Thank you for the offer! I shared about the new Doorpost blog and giveaway on facebook! I signed up to get the e-mail updates! Thank you for all that you do to help other parents raise up their children for Christ. I signed up for your blog and am looking forward to what I can learn. I subcribe to DP via email! Thnakyou for the offer! Good morning! I posted a link on my Facebook page, “like”d your Facebook page & subscribed to your blog. You were recommended to me by Bethany Delgado & am looking forward to learning more about you in your blog! I already like Doorposts on FB! 1) I have “liked” you on Facebook for a while now..
4) I shared about this new blog launch on my Facebook wall. Thanks for all you do and all your great products! I signed up for the blog updates. I subscribed to the blog and liked it on facebook! Love you guys!!! I shared this fabulous give-away on FB! Thank you for the offer! I’m now following your blog! And I am subscribed to your RSS feed. I *liked* this on FB. I signed up email alerts. This is a wonderful giveaway. The books are phenomenal and a great resource for teaching little ones to serve the Lord! I also “liked” Doorposts on facebook and have shared this site with others! I did 1&3 and I had already liked you on facebook. I recently got the small charts set, I am excited to start using them! I added your button to my blog. Thank you for your ministry! We signed up to receive emails. I signed up to receive blog posts. My comment above meant to say I “now” follow your blog! Haha! oops! I *already* like you on Facebook. I follow via email. Thank you for this opportunity! I have shared you on facebook! and last, but not least…I have posted/shared you on my blog! Looking forward to getting you blog post updates! I subscribed to your emails and am now following your site! I like you on Facebook as Beccy H.
On Facebook I shared about the launch and how much we appreciate this family-run business! I shared this on Facebook page as Beccy H.
I subscribed to your newsletter and follow your blog!! I liked you on my facebook!!! I shared with my facebook friends about your blog and giveaway! I so need this. Thank you for doing this. I subscribed to you via email, and liked you on Facebook. Thank you for Doorposts! You are a blessing to our family! I signed up for blog updates, liked on FB, and shared on FB! We are excited about your new blog! Would you also consider posting family updates (immediate and extended) on occasion? We love to hear all about what the Forster (and the Conser) families are up to! Signed up for e-mails. Thanks! I shared your blog launch on Facebook as well! I signed up to get your blog! I’m also registered to receive email updates. Thanks for the opportunity to win! Signed up to receive blog emails! So excited, I was just praying last night for some parenting wisdom and found your site! Thanks! I also shared your blog on Facebook! And last, but not least……..I liked you on Facebook! Shared about this blog launch on Facebook! I liked you on Facebook. But that hardly says enough… I LOVE what we have been able to do using Polished Cornerstones in our family. Thank you for such God inspired products for His character and values! I like Doorposts on Facebook! So glad to find you on there! I “liked” Doorposts on Facebook! How fun! I love giveaways, especially with great material! I have now added your “button” on my blog! How fun! I just finished meeting with three of my kids individually to go through some of your material. I have used it for years and it is still very helpful. Thanks so much! I just wrote about your giveaway on my blog! I liked you on facebook! and….. I signed up for email subscriptions! Thanks! I shared about blog launch on my facebook page! I am a follower of your site…and…. Finally, I shared you on my facebook page! I recommended you to my friends and family on FB and shared the link to your blog. I highly recommend your products!! Blogged about the new blog and giveaway. Shared a link to the giveaway via facebook. I shared about this blog on Facebook! I signed up for your blog. I’m looking forward to it. 🙂 We’ve always enjoyed your products and are excited to see you launching into this new area of encouragement. May God bless this new effort as well. I shared Doorposts on Facebook! I’m already a follower, a receiver of your newsletter and a “like-er” of your facebook page. I’m so excited about this giveaway, though, I did it all again! 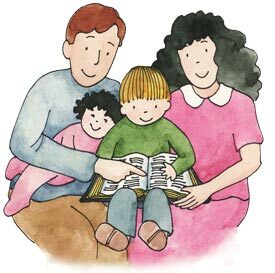 Thank you for all you do to help families raise their children in the admonition of the Lord. Blessings! Shared your link on Facebook. We’ve used your materials with our children and looking forward to using them with the granddaughters when they’re older. I think it’s wonderful that you’ve started this blog. I e-mailed friends about this great opportunity. I personally have used and given countless of your products as gifts to others for the last 17 years!!! Shared your blog on Facebook. I’ve already “liked” Doorposts on facebook a while back. Thank you for all you do to help us raise our kids! signed up for the email! I shared your giveaway via email. I shared your contest / site on FB to well over 4000-4500 friends. I subscribed to the blog feed to follow this site. thanks for the awesome products! I am now a follower of your blog via email. Thanks for the giveaway opportunity! I now follow your blog via Google Reader. I’m so excited about this, I love the doorposts products and look forward to reading this blog! I grabbed your button to put into my email signatures! I subscribed to receive this blog. I shared your blog launch on Facebook! I “liked” Doorposts on Facebook! I posted the link to this blog on Facebook! I love Doorposts!! I signed up to receive blog emails! I “like” Doorposts on facebook! Thanks for the wonderful resources, keep up the good work. I shared your link on my facebook profile. Hello! I shared on facebook and also “liked” on facebook. Thanks for the fun giveaways! Looking forward to the blog! I am officially a follower! I “liked” your site on facebook! Thanks for this opportunity! and then I signed up to receive email updates for the blog! I subscribed to receive your blog feeds. I subscribed to your updates via email. I am looking forward to more posts with parenting info! A much more ‘seasoned’ Christian woman keeps pointing myself and others who are raising young olive shoots to the Doorpost magazine/info. From what I’ve seen, you do a God-honoring job of promoting the Holy Scripture in all your publications; thank you for providing such a wonderful resource for so many! I subscribed to your blog. Thanks again! i shared about blog launch on facebook. I signed up for blog emails. I signed up to receive your e-mails! I “like” you on Facebook. I’m so excited you have a blog! I love your stuff, so I joined your blog! I “like”d Doorposts on Facebook. Thanks! We LOVE Doorposts materials – thank you for this opportunity!!! I grabbed your button and put it on my blog. Thanks! You always have great stuff! I am following through google friend connect. I signed up to receive your blog by e-mail. I love your products and have many of them. Now, I’m looking at what would be perfect for our little grandchildren! I shared about your blog on Facebook! I ‘liked’ you on Facebook and am so excited about this blog! THANK YOU! I love your products! I subscribed to your blog as well as told my friends on FB! I joined your site! Love what you are offering! Can’t wait to see how the website goes! I signed up for the email updates. I liked Doorposts on FB! I subscribed to get emails on your blog posts. This would be great for me to teach my three boys! I just signed up to receive blog emails. I signed up for email updates!! I “like” Doorposts on FB!! Sharing Doorpost blog link on Facebook , for friends to come and check out !! I shared the blog/giveway with my FB friends!! Signed up for emails, Thanks for all you do !! I shared a link to this giveaway on my facebook page. I tried to subscribe but when I clicked the subscribe button, it gives me an error. I “liked” your blog on Facebook, joined the mailing list, and shared it on my Facebook profile. I am following your site, thanks! I signed up to follow you with e-mail updates. So excited for your new blog! I’m following via Google Reader. Thank you for the fantastic giveaway as well! I shared your awesome blog on FB! I signed up for update emails. Can’t wait to see what’s next! I signed up for your blog. I am sure it is going to be encouraging! I shared Doorposts Giveaway with my FB friends. Shared about the new blog on Facebook! Love love love you guys!! I subscribed to your feedburner. I shared this on facebook and signed up for the blog. I signed up for the blog updates! I subscribed to receive your blog through my email… can’t wait! hi! i’m your newest follower! thank you for your GREAT products! shared the giveaway on FB! thanks so much! I LOVE Polished Cornerstones and other Doorposts products. I signed up to recieve emails about the blog. I also shared about the blog to my “mom” friends. I don’t have a blog, so that is the way I did it. I subscribed to follow this blog. I shared on Facebook and also “liked” you facebook page!! I subscribed to this blog! I signed up for the e-mail subscription! yay! Facebook now knows that I “like” Doorposts! I subscribed to the blog and liked Doorposts on Facebook! Hello! I am so excited about your new blog! I signed up to receive your blog emails. I shared about the new blog launch on my FB page. I wrote a blog post and added your button to my blog. I shared this post on my Facebook page…hurray! Hoping my “friends” will join in on the blog! I subscribed to the blog. Thank you for your resources and this giveaway! I liked on FB, and signed up to receive emails! I already “Liked” you on FB! Thank you for this giveaway, I love your products and mission. I “Liked” Doorpost on Facebook. I signed up to receive emails! I subscribed to you in Google Reader. I like Doorposts on FB. And finally….I “liked” your blog on fb. Thank you so much for the opportunity of a give away. Whoever the winner is, will be tremedously blessed! Blessings! Just wrote about Doorposts on my blog! I signed up to receive blog updates. I am following this site, I launched a blog on Facebook and I liked you on facebook!! I liked you on FB, Shared on FB and signed up for the e-mail updates….that’s 3 entries, right? I signed up for the blog, already ‘liked’ you on fb. I “LIKE” Doorposts on Facebook & shared it. Thank you. I receive you newsletters and now I’ve shared the link on Facebook. Great new blog, love the give away. Such great resources! I already “liked” you on Facebook and now I like you even more! Thanks for the encouragement! I shared your article on Facebook. I signed up for the new blog e-mails, too! excellent products! I’ve shared via FB, and will post on blog. I like Doorposts on FB!! I shared a link on FB. I did 1, 2, 3, and 4!!! Love your resources! We love Doorposts and are so glad to see you start a blog. Subscribed! I shared a link on Twitter. I am following your blog by e-mail subscription. Very excited to have daily access to character building lessons! I follow this blog now! Subscribing to blog + spreading the word to my nieces who blog. Excited about your new blog! I subscribed to the Doorposts blog! Thanks for the opportunity to win some of your awesome materials! I subscribed to the blog by email! Just shared you on Facebook! We are excited about the giveaway. We have been saving up for Plants Grown Up. We signed up for the blog emails. Thank you. I subscribed to your blog – thank you for the giveaway opportunity! signed up for your blog. I shared info about your giveaway on facebook! So excited to see your blog!! I just recommended your products 4 times in the last 10 days to 4 different mom’s groups in 4 different churches!! I LOVE your products!! I liked you on Facebook and shared your link. I am so excited about your blog!!! I like Doorposts on facebook. Thanks for offering the giveaways. I liked on FB. Thank you!! I signed up to receive blog e-mails. I signed up to receive your blog post. I subscribed to your blog through e-mail. I add you as a like on facebook. I am a follower of your NEW FANTASTIC BLOG! Thank you!! I signed up to recieve blog emails!! Woo Hoo so excited u have a blog!! Brilliant resources, I signed up to follow your blog using google reader. Shared about launch on Facebook!! “Liked” Doorposts on FB! Thank you! I am following you and I subscribed via RSS on my Google Reader. I became a fan of Doorposts on facebook! and I shared you on FB, too! Already “Liked” u on facebook!! So love all your products!! I signed up to receive email updates. I enjoy your materials and incorporate them into my homeschooling!! Thank you! Excited for the new website! Signed up for the blog. Looking forward to reading them. I posted about your giveaway on Facebook!!!! Shared on Facebook. Hope others will sign up too. i liked you on FB and signed op to follow the blog ! thanks for such a great site ! I shared your website with a friend! I linked your blog to my blog. I am looking forward to this blog! I “like” Doorsteps on Facebook! I shared your link on Facebook! I love your products and I’m now a follower of your blog! I’m not on facebook and I don’t have a blog, but I just shared your email with all the moms in my church. I’ve been recommending your products for years, now my friends can see for themselves! I subscribed to the blog via feedburner! I signed up to follow the blog with google. I shared on facebook and tweeted about it also!! I <3 Doorposts!!!!!!!! I bought this year "Plants Grown Up" —to do as devotion time with our four boys. TY!!! Shared on Facebook, “liked” on Facebook, and am following for updates! Shared on another forum, too! We love Doorposts’ material – simple, complete, very reasonably priced. Thanks! I subsrcibed to your blog via email! Thanks for the giveaways and I look forward to reading your blog! I like Doorposts on Facebook. Love your new blog! I signed up to receive the email updates! Hope I win – we love Doorposts products! I will be getting the blog updates by email. I shared you on fb. I signed up to receive blog emails! I signed up to receive emails of the blog. Thank you! I can’t wait to get your blog by E-mail! I “like” you on Facebook! Woot Woot!! I have signed up to receive your blog post emails … as well as I “like” you on Facebook! Thanks for trying to build a blog to learn about biblical parenting, character training and bible study. Looking forward to it. Truly God is continuously expanding your ministry to reach more people. God bless your ministry. I signed up for email updates. Thank you for the giveaway! I signed up by email for the blog. I posted on my blog about your giveaway and grabbed your button. Thank you for the giveaway. I “liked” your facebook page. Thank you! I am thrilled to find your blog! Thanks for an awesome giveaway! I signed up to receive email updates. Thank you! Subscribed to your blog email updates. already “liked” you on Facebook!! Shared on facebook about your giveaway. I’ve liked you guys on Facebook for a while now! I enjoy this resource – have all of the charts already! Signed up for the blog newsletter, already on FB and sent the info to my girlfriends. Woohoo! I liked “doorposts” on facebook. I have liked Doorposts on Facebook and have also shared your link with facebook friends and personal email addresses too. We love your character training tools and can’t wait to use more in the future. I signed up for emails from your blog. I like all of my blogs and letters to come from facebook. It makes my day more organized and faster then going to different sites. I just do not have time and forget about them. Facebook makes life easier for me. So happy you on. I placed you button on my blog. I signed up to receive e-mail updates on your beautiful new blog. So excited to see what’s in store! I shared the blog on Facebook! Don’t forget folks, every separate action you take (i.e., share on Facebook, subscribe to e-mail updates, etc.) should be commented on separately and gives you more chances to win!